Actor, comedian and singer Dan Aykroyd had one passion he had yet to bring to the screen: the paranormal. Inspired by an article on quantum physics and parapsychology, Aykroyd was determined to correct that. Wild with imagination, Aykroyd created an epic that followed a group of Ghostbusters with SWAT-like gear across time, space and other dimensions to battle giant ghosts and demons. It was meant to serve as another starring vehicle for him and his friend, fellow Saturday Night Live alum and bandmate John Belushi, to complement their 1980 hit Blues Brothers. Movie storyboards depicting the original uniform concepts. Presenting the script to director Ivan Reitman, Reitman realized that Aykroyd’s vision, in 1980s money, would cost several hundred million dollars to create (remember, kids, this was before CGI). At Reitman’s suggestion, Aykroyd paired up with Harold Ramis, with whom Reitman had worked with before, to help ground the script in reality and tone down the more elaborate sequences in order to secure a more realistic budget. The result was a movie about three washed-up scientists who discover how they could capture and hold a supernatural entity indefinitely. Losing their jobs at a prominent university lead them to turn this knowledge into a business and become the Ghostbusters. Aykroyd and Ramis would play scientists Dr. Ray Stantz and Dr. Egon Spengler, respectively. Following Belushi’s death in 1982, the role intended for him was reconceived and fellow SNL alum and Reitman collaborator Bill Murray was cast as Dr. Peter Venkman. Ernie Hudson was brought in as the everyman Winston Zeddemore, to whom the more technical elements could be explained for the audience’s benefit. Rounding out the crew was Annie Potts as Janine Melnitz, the no-nonsense secretary with a crush on Egon. Serving as the innocent victims the Ghostbusters must rescue from the threat of model Slavitza Jovan’s Gozer the Gozerian were Sigourney Weaver as cellist Dana Barrett and Rick Moranis as accountant and Daner’s stalker-ish neighbor Louis Tully. Released by Columbia Pictures, the film opened on June 8th, 1984 to critical and commercial success, becoming the second highest grossing film of the year behind Beverly Hills Cop. Ghostbusters vs. GhostBusters. Which do you like best? 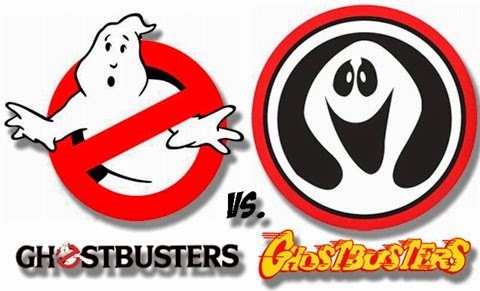 During production of the movie, the existence of Filmation’s live-action television show The Ghost Busters was discovered. Alternate names were considered up until the filming of the climax on Central Park West with crowds chanting “Ghostbusters,” causing a frenzied push by the producers to acquire the rights. Along with the movie’s success, Columbia was surprised at the number of younger fans the film had gained and contemplated continuing the franchise with an animated spin-off. Filmation president Lou Scheimer proposed a series to Columbia, going so far as to have initial designs for it produced. They passed. Undaunted, Filmation went ahead with their own GhostBusters cartoon based on their earlier show, featuring the sons of the main characters, in order to cash in on the popularity of the Ghostbusters name. Deciding not to be outdone, Columbia eventually partnered with DiC to create their animated series. As they only had the rights for the name for the movie, and as a little jab at Filmation, the title became The Real Ghostbusters. A short pilot was commissioned to give a general idea of the look and concept of the series. The characters were designed by Jim McDermott, but instead of trying to acquire expensive likeness rights, they went for the embodiment of the characters themselves. To help differentiate between the three white, brunette characters in distance and group shots, their hair colors were changed along with their bodies. Peter was given brown hair and an average build, Ray was made a pudgy redhead, and Egon a tall, slender blonde with a large hairstyle. To make them easier to animate, the proton packs and Ecto-1 were streamlined. Set to a re-recorded version of Ray Parker Jr.’s “Ghostbusters” performed by John Smith, the pilot followed the Ghostbusters from their firehouse all across the city as they battled random supernatural threats, including the green ghost they first busted (dubbed Onionhead during the film’s production due to the awful smell of the puppet used, but later named Slimer for the series) and Mr. Stay Puft (the only surviving giant entity from Aykroyd’s original concept). Promotional art featuring the refined designs. The series was greenlit, and the final revisions were made. 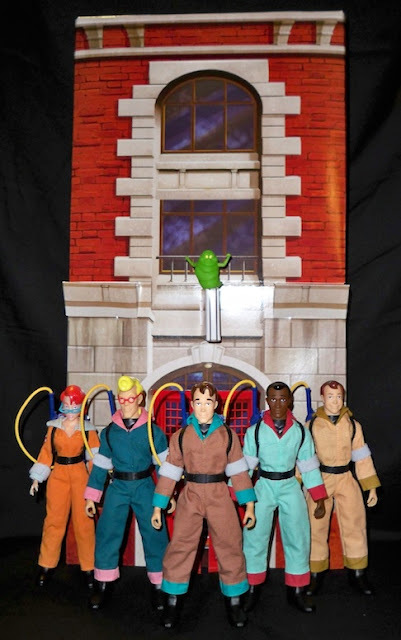 To further distinguish the Ghostbusters, as well as make them more appealing as toys, they were given new colored uniforms: Egon in blue with pink trim, Winston in gray with red trim and Peter in brown with green trim. Ray’s was largely kept the same from the movies and pilot. The equipment was further streamlined and changed from black to blue. 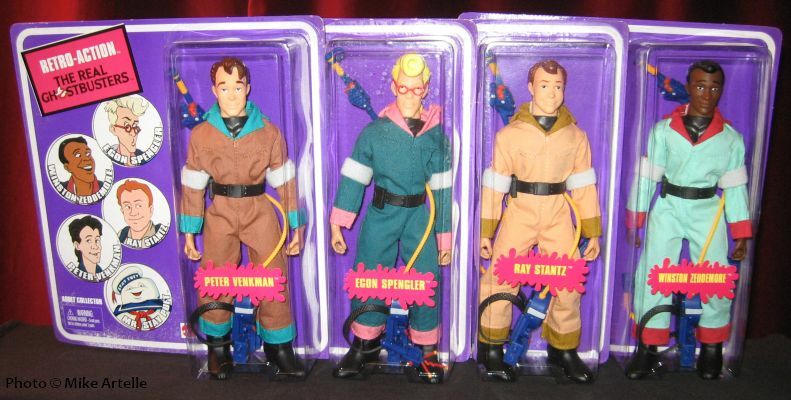 The pack designs from the pilot, though, continued to live on as they were used as the basis for the action figure line produced by Kenner. Slimer was also softened to look friendlier and became the Ghostbusters’ live-in ghost mascot as a further draw for the kids. The containment unit, where a captured ghost was stored, went from a small wall panel to a massive room-sized device in the basement of the firehouse where the Ghostbusters were headquartered. Ivan Reitman, Michael C. Gross and Joe Medjuck, the latter two producers on the film, served as producers for the series. Ernie Hudson was the only actor from the movie to audition for the role of his character in the series, but somehow lost out to then up-and-coming comedian Arsenio Hall. 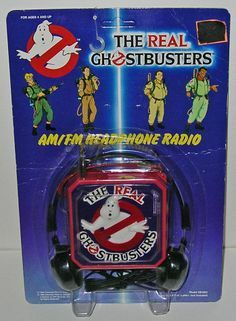 Hall also provided the voice for the commercial bumpers, spoken through the ghost in the no-ghost logo. Maurice LaMarche, a known impressionist, was asked not to impersonate Ramis when auditioning for Egon. He did and got the part anyway, although he began the series with a much deeper tone for the first few episodes than he would use for the remainder. Lorenzo Music was cast as Peter, Frank Welker as Ray and Slimer, and Laura Summer as Janine. Another unusual aspect of the show was that the cast recorded their lines together to retain the ensemble feel of the film, whereas many shows had their actors recording individually. Often, when someone was unable to make a session, the other actors would have fun imitating them for the duration of the recording. The Real Ghostbusters soundtrack album cover. The producers wanted to feature music in the series much like was featured throughout the movie. Ollie Brown, a friend of Ray Parker, Jr., organized a duo called Tahiti comprised of Tyren Perry and Tonya Townsend. They were brought on board and provided songs in 10 early episodes, which were later released as a soundtrack album for the show by Polygram Records. However, as the series began to pick up steam on its own, they decided the added expense and effort was no longer needed and kept to just using the standard series score by Haim Saban and Shuki Levy. One of the big bads: Samhain, the spirit of Halloween. The series was simultaneously produced for broadcast on ABC Saturday mornings with 13 episodes and syndication with 65 episodes, leading to a whopping 78 episodes made during the first season’s production. J.Michael Straczynski (abbreviated as JMS, of Babylon 5 fame), who loved the movie, met with the producers and was brought on as story editor and writer for a number of episodes. Given absolute freedom, JMS and the writers, which included Richard Mueller (who also penned the movie adaptation novel), Chuck Menville, Len Janson, Michael Reeves and even comic scribe J.M. DeMatteis, delved deep into mythology, science fiction, obscure occult references and many other places while embracing its movie roots, creating a very mature yet still kid-friendly experience. 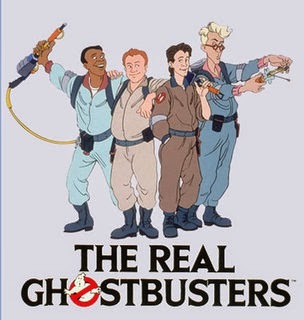 And it worked, as The Real Ghostbusters met with critical acclaim when it debuted on television. The many faces of Janine, from The Real to Slimer! to Extreme. Unfortunately, parent groups found the show a bit too scary for children and expressed their displeasure to the network. As a result, ABC brought in consultants Q5 to retool and “improve” the show as well as the rest of their Saturday line-up. Their suggestions included giving the Ghostbusters specific roles: Egon became the brain, Ray the builder, Peter the comedic con-man, and Winston the driver. Janine was designated to be the den mother, with her feisty personality toned down and her design altered; her short hair was softened and lengthened as was her skirt, and her pointy glasses were rounded as “sharp objects frighten children.” Summer was replaced by Kath Soucie, who had a less-harsh voical performance. The story content and subject matter was to be toned-down to be even more kid-friendly and a greater focus was put on Slimer, which resulted in his receiving more intelligible speech patterns and slowly working his way to the center of stories. Peter also became less hostile towards him, giving him the nickname “spud.” New recurring children characters called the Junior Ghostbusters were introduced to give the intended audience characters they could relate to. 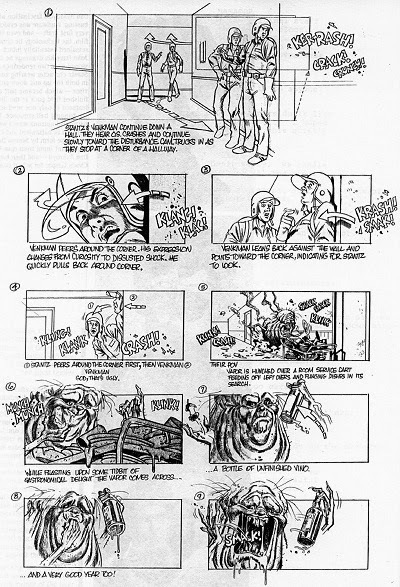 The animation and character designs were also altered slightly, with Ray becoming thinner and Slimer gaining a tail. Under protest about these changes and many others that were successfully shot down (such as eliminating Ray from the cast), JMS quit the show. Janson and Menville were promoted to story editors in his place. Ray has gone on a diet. Further changes came as the series progressed. Music was replaced by comedian Dave Coulier (who would become famous as Uncle Joey on Full House) for the second season. Two reasons for this persist: either Murray approached Reitman with the complaint that Peter sounded like Garfield (also voiced by Music) while the others sounded like the actors (made ironic by Murray voicing Garfield in the two live-action movies) or Medjuck wanted someone who could sound more like Murray. This also created some confusion for viewers as the syndicated episodes aired alongside season 2 with Music and Summer still in their roles. At the end of the season, Hall began development on the highly-successful first incarnation of The Arsenio Hall Show and left the series. He was replaced by Buster Jones, with Welker rerecording the commercial bumpers in a Slimer-like voice. For the third season, the show was extended to an hour and retitled Slimer! And the Real Ghostbusters, complete with a new Slimer-centric opening sequence that was later given a new recording of the theme song. A regular Ghostbusters adventure would precede two short Slimer adventures, done in a completely different animation style that was more rounded and cartoony. 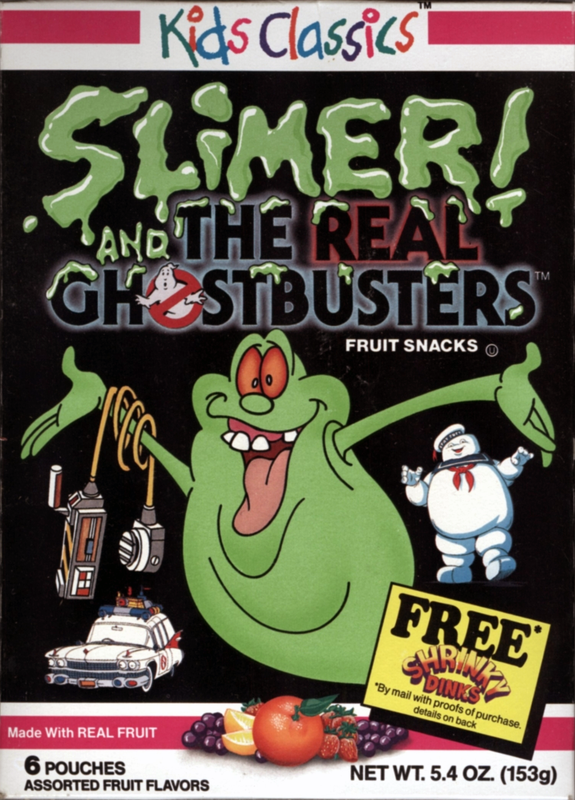 Slimer’s segments had an all-new supporting cast such as ice cream truck driver Chilly Cooper (Cree Summer), con-man Rudy (Jeff Marder) and Scottish Terrier Fred (Wleker) who resided at the hotel where Slimer was first encountered. Slimer’s nemesis was deranged scientist Professor Norman Dweeb (Jeff Altman) and his dog, Elizabeth (Welker), who sought to capture Slimer and experiment on him. Dweeb and Elizabeth would be the only Slimer segment characters to cross over into the main show. Following the release of Ghostbusters II, Louis Tully (Roger Bumpass) was added to the cast in season 4 and Janine’s hairstyle was changed to resemble her movie counterpart’s. The mood slime from the second movie also made an appearance, however colored yellow instead of pink. The Ghostbusters examine the mysterious changes in Janine in "Janine, You've Changed." The changes made to the show proved unpopular, and viewership steadily declined. ABC had, at one point, asked JMS to return as story editor, but he was busy with other projects. He did, however, contribute several scripts to the show including “Janine, You’ve Changed” which gave an in-story explanation to Janine’s constant redesigns. 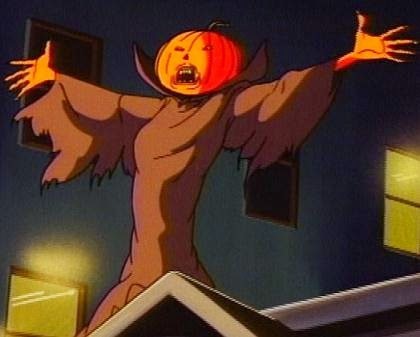 He also wrote the show’s only prime-time special episode, “The Halloween Door.” The show managed to last for six seasons on ABC before being cancelled in 1991. All through the show’s production, Kenner produced action figures, vehicles, a firehouse playset and child-sized versions of the equipment for North America, Germany, Italy, France, the Netherlands and the United Kingdom. Internationally, the toys were produced by Estrela in Brazil, Jocsa in Argentina, and Auriken in Mexio. 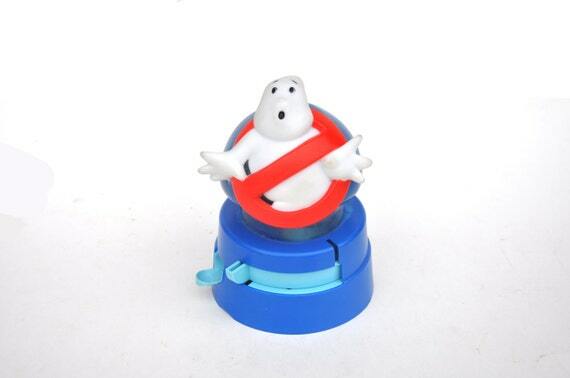 Each series of the figures featured a line of Ghostbusters, mostly with different accessories but sometimes featuring special actions like bugging eyes and spinning heads. Janine was featured in four of the series before being replaced by a Louis figure for the remainder of the line. Aside from the figures, the show’s name was slapped on almost everything imaginable: TV tray tables, miniature gumball machines, radios, yoyos, bath products, shaving kits, bedding, puzzles, board games, watches and more. 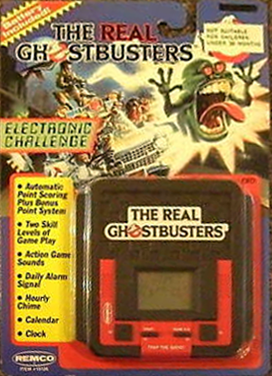 Real Ghostbusters handheld game by Renco. 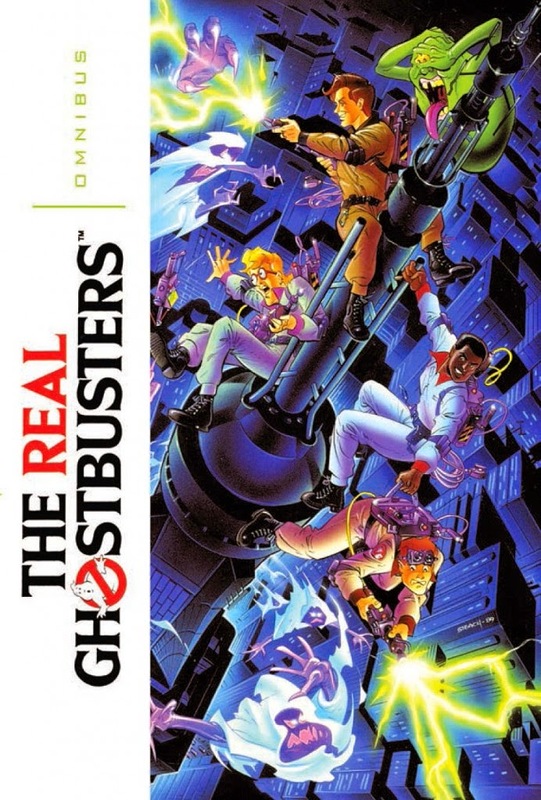 In 1987, Data East produced a Real Ghostbusters arcade game that was a 360-degree top-down shooting game. It was later ported to various home consoles. In 1988, Remco released a handheld game that featured Peter having to repel a horde of ghosts as they descended down on him. Remco also produced two electronic table-top games. In 1993, a Game Boy game was developed by Kemco and released by Kotobuki Systems in Europe and Activision in America. The game had very little to do with the show or concept as it was originally developed as a Mickey Mouse game in Kemco’s Crazy Castle series of games called Mickey Mouse IV: the Magical Labyrinth. In Europe, it featured Garfield while the American version featured only Peter as he tries to navigate through an enemy-filled maze. The Real Ghostbusters omnibus from IDW, collecting the first half of NOW's run. In 1988, licenses for a comic based on the show were granted to Marvel’s United Kingdom division for international publication while NOW Comics obtained the domestic rights. The Marvel books were magazine-sized and ran weekly until its last few issues, featuring several short comic strips and a prose story. Many future prominent creators worked on the series, including Richard Starkings, Phil Hester, Dan Abnett, Andy Lanning and Al Williamson. Marvel also made a point of including various items exclusive to the toy line into their stories. NOW’s series featured a more mature tone than the Marvel books and typically featured only one story per issue. It was primarily written by James Van Hise with art by future Mortal Kombat co-creator John Tobias. Occasionally during their runs, Marvel and NOW would share stories and cover art, and both books featured the only time the character of Dana would be rendered in The Real style as she never appeared on the show. 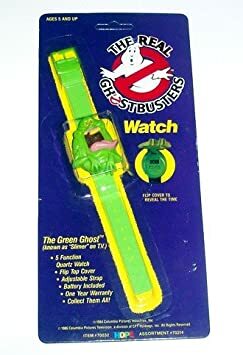 Both companies also produced a short-lived Slimer! spin-off book, however the Marvel version was typically a reprint of the NOW series. Both series outlived the show, ending in 1993. In 2006, Titan Books reprinted some of the Marvel UK strips in three digest-sized collections. The last vestige of the series came from the most unlikely place. In a promotional tie-in to the show, Hi-C began production of a flavor called Ecto-Cooler: a green-colored orange and tangerine drink that featured Slimer on the packaging. The drink lasted well beyond the show, remaining unchanged until 1997 when Slimer was finally removed. The flavor continued on and was eventually renamed “Shoutin’ Orange Tangergreen” in 2003 before eventually being discontinued altogether. Along with trying to petition Coca-Cola, the makers of Hi-C, to bring the flavor back, fans of the drink have taken to figuring out the recipe for it and making their own. Ecto-Cooler did return for a limited time (still without Slimer) in 2016 as part of a promotion for Ghostbusters: Answer the Call. Other food items included a line of marshmallow cereals by Ralston, canned pasta and sauce by Heinz, and fruit snacks by Kids Classics. Extreme team: Slimer, Garrett, Kylie, Eduardo, Roland and Egon. 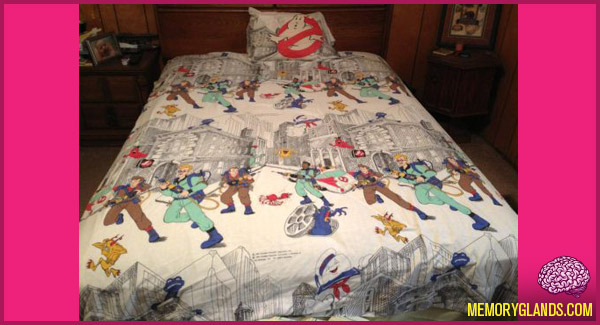 In 1997, Sony, now owner of Columbia and its properties, sought to revitalize the Ghostbusters brand with a new animated series entitled Extreme Ghostbusters (originally Super Ghostbusters, both popular adjectives to add to the titles of things throughout the 80s and 90s). The Ghostbusters had disbanded and Egon (LaMarche) remained behind to monitor the containment unit with Janine (Pat Musick) and Slimer (Billy West, whose casting was okayed by Welker due to other commitments) while he taught at the university. Circumstances led to Egon’s only students—cynical slacker Eduardo Rivera (Rino Romano), intelligent and gifted Roland Jackson (Alfonso Ribeiro), goth Kylie Griffin (Tara Strong) and wheelchair-bound jock Garrett Miller (Jason Marsden)--to reform the Ghostbusters. While many things were similar to The Real, the designs for the show were owned by DiC, necessitating some redesigns (some explained in-story) as the show was now produced by Sony's own Adelaide Productions. The series, despite having some of the same writers and producers from the previous show, failed to achieve the same success and was cancelled after only one season. 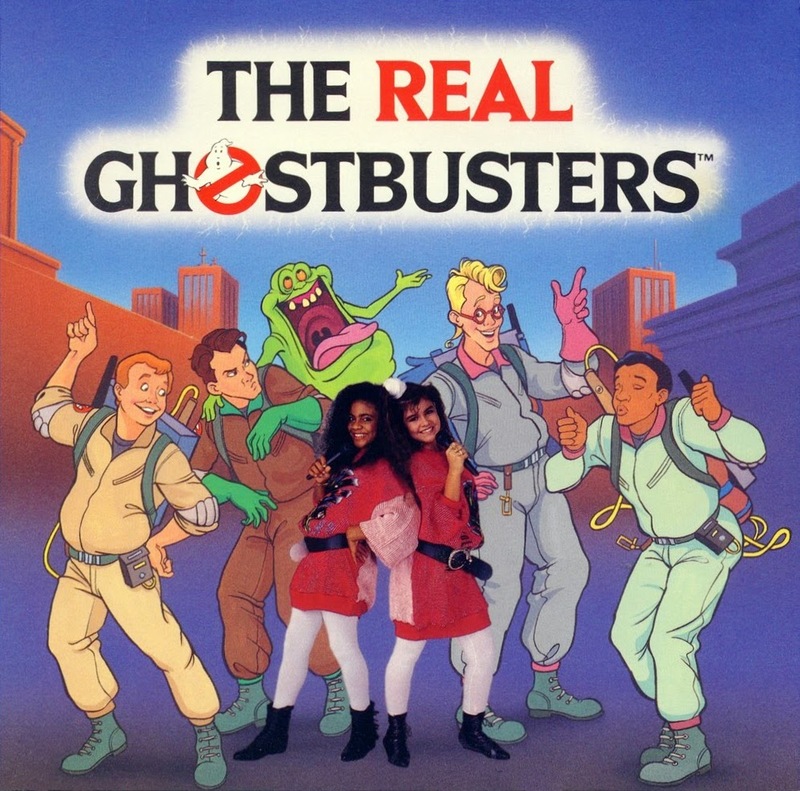 But, not before the other Ghostbusters (portrayed by their Real actors) made an appearance in the two-part series finale. The Real Ghostbusters complete series DVDs by Time Life. 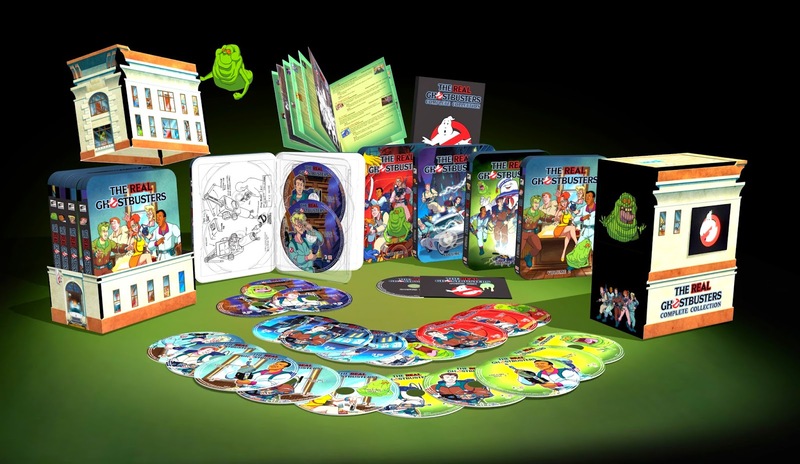 At the conclusion of Extreme, all was quiet on the animated Ghostbusters front until three bare-bones collected DVDs were released in 2006 with four episodes on each. This was the first time The Real had been available on home video since the original VHS releases during the show’s run. Sales were sufficient enough that Time Life produced a full-series collection in 2008, which included steelbook cases (replaced with similar plastic cases in later releases) with design sketches inside, an episode guide and a bonus disk of additional content. 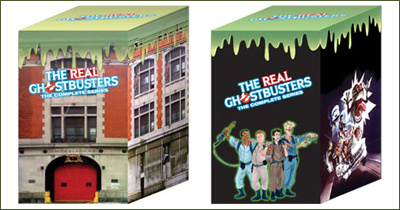 Fans got the chance to vote for the set’s packaging: a slimed black box with some images on it, or a reproduction of the firehouse (pitched using an image of the real New York firehouse). The firehouse packaging won out, resembling the cartoon firehouse with two lenticular holograms. The steelbooks within were later individually released as season sets. The set was further broken down in 2016 by Sony Home Entertainment into 10 volumes, each containing a dozen or so episodes and reusing some of the Time Life artwork. The first five volumes were put together in a box set at the time of their release, and in 2017 all 10 volumes were gathered together into a single box. The RetroAction figures on display with the included Firehouse backdrop. In 2011, five sets of Minimates figures based on the series were made, while Mattel produced a line of Reto-Action action figures; 7” dolls with cloth uniforms. Although the show has yet to return to its own comic series, several references have been made to it in 88MPH’s Ghostbusters: Legion and throughout IDW’s ongoing Ghostbusters series, as well as a couple of back-up features set in the animated world. IDW also published omnibus collections of NOW’s books. “Ghosts R Us” (9/13/86) – Slimer accidently frees a ghost family, who seek to get revenge on the Ghostbusters by being better Ghostbusters. “Killerwatt” (9/20/86) – The Ghostbusters must remove an electrical ghost from the city’s power plant. “Mrs. Roger’s Neighborhood” (9/27/86) – The Ghostbusters investigate a haunted house which turns out to be a decoy for a larger plot to open the containment unit. “Slimer, Come Home” (10/4/86) – Slimer runs away from home and gets involved with mean Poltergeists, whose leader wants to absorb him and other ghosts to become invincible. “Troll Bridge” (10/11/86) – A troll comes to New York and his family come looking for him, taking over a bridge and threatening the city unless he’s returned. “The Boogieman Cometh” (10/18/86) – Meghan and Kenny Carter come to the guys to get the Boogieman out of their closet, leading to the revelation that Egon has encountered him before. “Mr. Sandman, Dream Me a Dream” (10/25/86) – To bring peace to the world the Sandman seeks to put everyone to sleep…for 500 years. “When Halloween Was Forever” (11/1/86) – Samhain, the spirit of Halloween, is freed and seeks to stop time and make Halloween last forever. “Look Homeward, Ray” (11/8/86) – Ray is invited to participate in a parade in his hometown, but a jealous rival casts some spells releasing a creature on the town. “Take Two” (11/15/86) – While overseeing the production of their movie, the guys have to face a ghost terrorizing the studio demanding absolute quiet. “Citizen Ghost” (11/22/86) – Reporter Cynthia Crawford gets the story of what happened following the Gozer battle and how Slimer came to live with them. “Janine’s Genie” (12/6/86) – Janine comes to possess a genie, which seems to grant her wishes but is really allowing more ghosts to enter the world. “Xmas Marks the Spot” (12/13/86) – The guys unknowingly rescue Ebenezer Scrooge from the three spirits in the past, resulting in the end of Christmas in the present. “Knock, Knock” (11/6/87) – Construction workers accidentally find and open a door that unleashes a horde of supernatural entities that seek to transform the entire world. “Station Identification” (12/9/87) – Ghosts attempt to take over the world via their own television station, which they can use to transport themselves through any TV. “The Spirit of Aunt Lois” (11/9/87) – Ray’s Aunt Lois hires a phony psychic to remove ghosts from her house, but ends up enraging them instead. “Sea Fright” (11/10/87) – A ghostly pirate ship comes to New York to reclaim their treasure. “Cry Uncle” (11/12/87) – Egon’s Uncle Cyrus, not believing in ghosts, forces Egon to quit the team and the guys’ trying to convince Cyrus otherwise results in Mr. Stay Puft being freed. “Adventures in Slime and Space” (9/15/87) – Egon’s new invention causes Slimer to split into millions of little copies, roaming around and sliming the entire city. “Night Game” (9/22/87) – Winston ends up caught in an ancient battle between good and evil whose fight takes the form of their surroundings: a baseball game. “Venkman’s Ghost Repllers” (10/20/87) – Peter’s father sells phony ghost repelling ponchos that causes a science expedition to become trapped in the New Jersey Parallelogram. “The Old College Spirit” (11/27/87) – Peter’s old fraternity calls the guys to remove the ghosts of former students who were expelled and swore revenge on the university. “Ain’t NASA-Sarily So” (11/17/87) – The guys trek to space to rescue the new space platform from a power sucking ghost. “Who’re You Calling Two-Dimensional?” (9/24/87) – The guys investigate the haunting of Walt Fleishman’s old studio where they enter a cartoon world and meet his creation Dopey Dog. “A Fright at the Opera” (10/26/87) – Valkyries are terrorizing the opera at the behest of the Phantom of the Opera. “Doctor, Doctor” (10/13/87) – A chemical plant bust leaves the guys covered in slime they can’t remove, which seems to have a powerful hunger to feed off other ectoplasm. “Ghost Busted” (10/22/87) – Slow business force the guys to take other jobs before they find their new niche: crime busting! “Beneath These Streets” (11/25/87) – Ray discovers ghosts have disrupted the grease flow to the rotating pillar holding up Manhattan, resulting in earthquakes and heat waves. “Boo-Dunit” (10/30/87) – Winston must solve a late mystery author’s final story in order to remove the ghosts acting it out in her house. “Chicken, He Clucked” (10/19/87) – A deranged man uses magic books to remove all the chickens from the world, but the demon who helped him wants out of the deal. “Ragnarok and Roll” (9/16/87) – Heartbroken Jeremy uses a magic flute to bring about the end of the world. “Don’t Forget the Motor City” (12/3/87) – WWII gremlins interfere with the operations of a Detroit Generous Motors plant. “Banshee Bake a Cherry Pie?” (10/28/87) – Peter’s favorite rock-star singer Shanna O’Callahan turns out to be a banshee who wants to use her concert to spread chaos across the country. “Who’s Afraid of the Big Bad Ghost” (10/9/87) – The guys are summoned to a mansion to bust the ghost of Uncle Horace, who turns out to be the one who actually called them. “Hanging by a Thread” (12/10/87) – The guys are put in the position to retrieve the Shears of Fate of the Three Fates from the underworld before a demon gets them. “You Can’t Take it With You” (10/14/87) – A billionaire opens a doorway to the afterlife to take his money with him, unleashing a horde of ghosts on the world. “No One Comes to Lupusville” (10/5/87) – The guys end up enlisted in a war between vampires and the original residents of Lupusville. “Drool, the Dog-Faced Goblin” (10/29/87) – The guys believe a real goblin in a fake sideshow is causing havoc in all the surrounding towns. “The Man Who Never Reached Home” (10/12/87) – Simon Queg has been cursed for 100 years to never reach home, and when Ray tries to help him he inherits the curse himself. “The Collect Call of Cathulhu” (10/27/87) – The spawn and cult of Cathulhu steal the Necronomicon from the library in order to bring Cathulhu back to Earth. “Bustman’s Holiday” (11/13/87) – Ray must eliminate the ghost in his inherited Scottish castle, which causes two warring clans to rise up and resume their centuries-old fight. “The Headless Motorcyclist” (11/3/87) – The guys have to save the descendant of Ichabod Crane from the Headless Horseman and Peter from being framed for the Horseman’s latest victim. “The Thing in Mrs. Faversham’s Attic” (11/4/87) – Peter, reminded of his mother, takes Mrs. Faversham’s case for free to remove the ghost in her attic. “Egon on the Rampage” (12/8/87) – Reporters mucking with the guys’ equipment causes Egon’s soul to be exchanged with that of a demon’s. “Lights! Camera! Haunting!” (12/7/87) – A movie director enlists real ghosts to appear in his picture in exchange for help in eliminating the guys. “The Bird of Kildarby” (10/6/87) – The mayor hires the guys to remove the ghosts from an Irish castle erected in Central Park. “Janine Melnitz, Ghostbuster” (9/29/87) – It’s up to Janine to save the guys from a powerful elder god. “Apocalypse—What, Now?” (11/18/87) – Janine accidentally unleashes the Four Horsemen by reading a book, bringing the Apocalypse to New York. “Lost and Foundry” (10/16/87) – A ghost becomes fused with molten steel, and everything made from it comes to life seeking to bring itself back together. “Hard Knight’s Day” (11/30/87) – Peter’s date drags him to a tapestry display where they come to life seeking to drag his date back in with them. “Cold Cash and Hot Water” (10/8/87) – Peter’s father uncovers a demon trapped in black ice in Alaska, which in a cash grab he frees in New York. “The Scaring of the Green” (11/16/87) – In exchange for getting the guys out of legal trouble, police chief O’Malley asks them to help rid his family of a leprechaun’s curse. “They Call me MISTER Slimer” (9/18/87) – To earn money Slimer becomes the bodyguard for a bullied kids, but then the bullies hire their own monsters to deal with Slimer. “Last Train to Oblivion” (11/24/87) – Peter is trapped on a train racing to oblivion whose conductor, Casey Jones, seeks redemption for a terrible train crash a century ago. “Masquerade” (12/1/87) – Peter makes bullied Kenny Fenderman a Junior Ghostbuster and gives him an untested device, prompting his antagonists to challenge Kenny to stay in a haunted house. “Janine’s Day Off” (9/14/87) – While Egon visits Janine’s relatives with her, the others deal with an imp infestation at the firehouse. “The Ghostbusters in Paris” (10/23/87) – Workers accidentally break a device in Gustave Eiffel’s secret lab, releasing the ghosts held within the Eiffel Tower. “The Devil in the Deep” (12/4/87) – Necksa, ruler of the sea elementals, declares war on the surface world for their constant pollution of the oceans. “Ghost Fight at the O.K. Corral” (11/11/87) – The guys face the Earp brothers and Doc Holiday at Tombstone, Arizona. “Ghostbuster of the Year” (10/1/87) – A woman hires the guys to remove the ghost from Hearst Castle for the title of Ghostbuster of the Year. “Deadcon I” (12/2/87) – Ghosts hold a convention at a hotel and the owners want them out. “The Cabinet of Calamari” (9/30/87) – A magician sends Peter through his cabinet into another dimension. “A Ghost Grows in Brooklyn” (11/20/87) – A ghost possesses the geranium Janine takes back to her place, causing it to grow large enough to conquer the city. “The Revenge of Murray the Mantis” (11/2/87) – Ghosts possess the Murray the Mantis parade balloon, and the guys’ only chance to beating it rests with Mr. Stay Puft. “Rollerghoster” (9/23/87) – A carnival cashes in on the guys by having a roller coaster called Ecto-1, which ends up taken over by ghosts. “I Am the City” (11/23/87) – Babylonian god Marduk and the dragon Tiamat wage their ancient battle in New York City. “Moaning Stones” (11/5/87) – Winston is the only person who can banish the demon released by three ancient stones. “The Long, Long, Long, Etc. Goodbye” (10/7/87) – A private detective’s ghost helps the guys free a thief who was possessed by an Egyptian curse 40 years ago. “Buster the Ghost” (9/21/87) – A disgraced tooth fairy, Buster, tries to befriend the guys by bringing ghosts right to them. “The Devil to Pay” (11/19/87) – Peter, Winston and Ray go on a game show run by a minor demon who seeks to claim their souls and become the next Devil. “Slimer, is that You?” (9/26/87) – A ghost challenges Egon in a battle of the mind for New York—just as Egon ends up with his mind switched with Slimer’s. “Egon’s Ghost” (9/28/87) – Egon’s invention causes him to phase slightly out of reality, rendering him essentially a ghost. “Captain Steel Saves the Day” (9/17/87) – The hero and villain from a comic about to be cancelled escape from the pages and bring their adventures to the real New York. “Victor the Happy Ghost” (10/15/87) – The guys take in a ghost too cute to bust, not know it’s really a hideous malevolent spirit. “Egon’s Dragon” (10/2/87) – The guys accidentally awaken a large dragon that Egon’s ancestor had summoned centuries earlier. “Dairy Farm” (9/25/87) – The guys go on vacation at Ray’s cousin’s farm, but discover the former owners’ ghosts remain to ensure their farm is taken care of. “The Hole in the Wall Gang” (10/21/87) – A haunted house is full of holes where ghosts emerge, and the bigger the hole the bigger the ghost. “Baby Spookums” (9/12/87) – Slimer decides to take care of a small, friendly ghosts that has wandered into New York, not knowing his parents have come looking for him. “It’s A Jungle Out There” (9/19/87) – A demon makes animals human-like, using them to help take over the world. “The Boogeyman is Back” (10/3/87) – A near-fatal fall allows Egon’s fears to get the better of him, giving the Boogeyman a way to escape his realm. “Once Upon A Slime” (10/10/87) – Slimer places his book on one of Egon’s devices, accidentally bringing its contents to life. “The Two Faces of Slimer” (10/17/87) – Something escapes the containment unit and possesses Slimer, making him a monster when he sleeps. “Sticky Business” (10/24/87) – The guys release Mr. Stay Puft for a charity event but end up also freeing a more malevolent entity in the process. “Halloween II ½” (10/31/87) – Samhain is freed from the containment unit and turns the firehouse into his own personal fortress. “Loathe Thy Neighbor” (11/7/87) – The guys are hired by a family to find out why weird things happen in their house. “Big Trouble With Little Slimer” (11/21/87) – Walter Peck returns and after failing to get the guys arrested manages to legally confiscate Slimer and plan his destruction. “The Copycat” (12/5/87) – A shapeshifter is loose in the firehouse. “Camping it Up” (12/12/87) – The guys head out on a camping trip that is anything but relaxing. “The Grundel” (11/14/87) – Lee asks the guys to find out why his brother Alec is doing bad things, and they discover he’s being influenced by a Grundel and in danger of becoming one. “Transylvania Homesick Blues” (12/11/87) – The guys are hired by a vampire to help prove the giant bat-men attacking a village aren’t of his people. “The Joke’s On Ray” (9/10/88) – Ray inherits a joke store and releases two imps that feed off practical jokes. “Flip Side” (9/17/88) – Peter, Egon and Ray are transported to another dimension where ghosts live in the city and mortals are dealt with by the Peoplebusters. “Poultrygeist” (9/24/88) – A werechicken hatches from the egg the guys recover from a job and bites Egon, turning him into one. “Standing Room Only” (10/8/88) – Too sick to work, Peter invents a ghost attractor to bring ghosts to the firehouse, but they come to escape an entity that will destroy New York. “Robo-Buster” (10/15/88) – Janine’s new boyfriend steals the guys’ technology to make a robotic Ghostbuster that seemingly destroys ghosts instead of trapping them. “Short Stuff” (10/22/88) – The Ghostmaster sends bounty hunters after the guys, resulting in their being shrunk. “Follow That Hearse” (11/12/88) – A ghost escapes the guys and possesses Ecto-1. “The Brooklyn Triangle” (11/19/88) – Winston’s father’s construction company unearths a portal to a realm where all lost items go, including Winston and his father. “Something’s Going Around” (9/9/89) – A ghost supplies the guys with potato crisps that make people allergic to ghosts. “Three Men and an Egon” (9/16/89) – A clock monster causes Egon to age backward to nothingness. “Elementary My Dear Winston” (9/23/89) – The ghost of Sherlock Holmes recruits Winston to help him find Moriarty in New York when Watson ends up captured. “If I Were a Witch Man” (9/30/89) – The guys are called to deal with a witch who wants revenge on the descendants of those who imprisoned her, which includes Egon. “Partners in Slime” (10/7/89) – Peter has to go to Ghost Town to rescue Louis and Janine from Poso, a ghost who wants to take over the business. “Future Tense” (10/14/89) – The guys are paid for a job with a new TV which Ray discovers predicts their future, including their deaths. “Jailbusters” (10/21/89) – The guys are captured by ghosts and put on trial, leaving Janine, Louis and Slimer to save them. “The Ghostbusters Live! From Al Capone’s Tomb!” (10/28/89) – The guys await the arrive of Al Capone’s ghost but end up transported to the other side instead. “Trading Faces / Transcendental Tourists” (11/18/89) – A Slimer lookalike sends Slimer and Louis into Ghost World. / A vacationing ghost family seeks to remove anything that interrupts their peace and quiet. “Surely You Joust / Kitty-Cornered” (11/25/89) – The guys must rescue Janine from a medieval fate. / Slimer finds a wish-granting cat. “Slimer’s Curse / Til Death Do Us Part” (12/2/89) – Slimer’s lottery winnings are paid in cursed money. 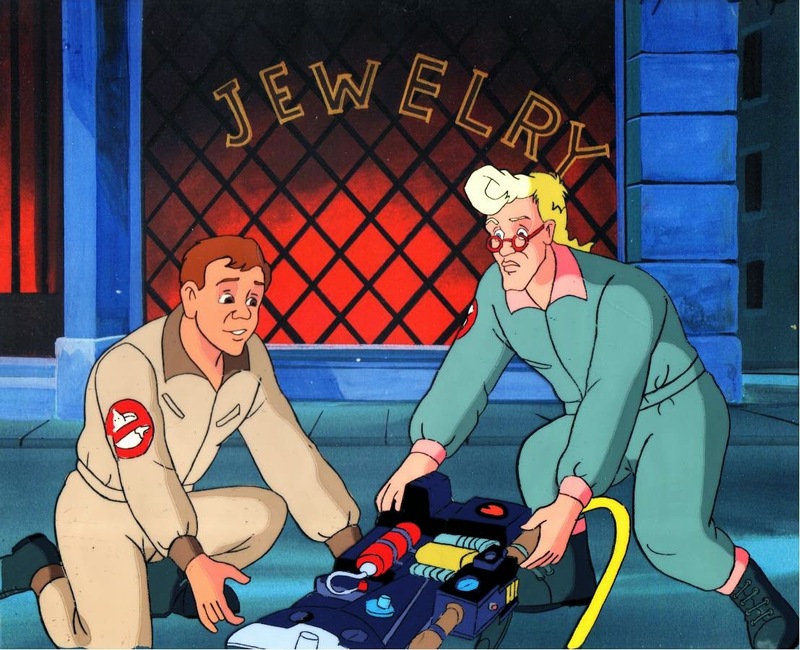 / The guys’ temporary replacement for Janine is a ghost who wants to marry Egon. “It’s About Time / The Ransom of Greenspud” (12/9/89) – An accident with a trap sends the guys and Slimer back to 1959. / Ghosts abduct Slimer to exchange him for Spiderlegs’ freedom. “Revenge of the Ghostmaster / Loose Screws” (12/16/89) – The Ghostmaster returns and casts a spell on the guys disabling all electronics around them. / Slime breaks a trap and poorly repairs it, resulting in the essence from the next ghost trapped to ooze out and bring objects to life. “Venk-Man! / Slimer Streak” (12/23/89) – Peter is turned into a powered superhero. / The guys have to play games in order to stop the train they’re stuck on. “The Halloween Door” (10/29/89) – A group wants to eliminate Halloween, breaking a seal in the process and loosening Boogaloo on the world. “Russian About” (10/27/90) – The guys must stop a Russian cult from awakening one of the Old Ones. “The Haunting of Heck House” (9/29/90) – Peter regales local kids with the story of when the guys had to spend the night in a haunted house without their packs. “You Can’t Teach an Old Demon New Tricks” (9/15/90) – The guys end up in another dimension where they meet a demon who insists on Ray teaching him magic tricks. “Janine, You’ve Changed” (9/8/90) – The guys realize Janine has gone through many unexplained changes over the years, learning there’s a supernatural reason behind it. “Mean Green Teen Machine” (10/6/90) – A trio of pizza-loving ghosts invade the guys’ dreams in order to trap them forever. “Spacebusters” (10/13/90) – Winston gets to go up to a space station where a ghost is absorbing the life force of anyone there. “Guess What’s Coming to Dinner” (11/24/90) – The guys return from a vacation only to discover a family of ghosts had moved into the firehouse. “Very Beast Friends” (12/8/90) – Two Sumerian gods possess Peter and Ray in order to have a definitive ending to their millennial-long fight. “Ghostworld” (9/22/90) – A ghost uses an amusement park to capture the guys, leaving only a sick Egon and his mother to save them. “Afterlife in the Flast Lane” (11/17/90) – A ghost gamesmaster takes a charity race and brings it to the Netherworld. “The Slob” (11/3/90) – Dweeb makes an arrangement with the Glob to capture Slimer in exchange for freeing the Sleaze. “Busters in Toyland” (12/15/90) – The guys have to rescue Louis’ nephew from Toyland after Louis gives him toys possessed by ghosts. “My Left Fang” (10/20/90) – A German town requests that the guys save their local ghosts from a creature that feeds on them. “Stay Tooned” (12/1/90) – An accident brings cartoon character Sammy K. Ferret to life, causing the real world to blend with the animated one. “The Magnificent Five” (12/22/90) – The guys have a showdown with Black Bart in Texas. “Deja Boo” (11/10/90) – Dweeb captures Slimer and uses a device to read his mind and learn the vulnerability of ghosts. “The Treasure of Sierra Tamale” (9/7/91) – Ray and Slimer join Peter’s father to find a treasure in Mexico. “Not Now, Slimer!” (9/14/91) – While the guys take on a squid ghost, Slimer tries to evade Professor Dweeb. “Attack of the B-Movie Monsters” (9/21/91) – The guys face off against Japanese movie monster ghosts in Japan. “20,000 Leagues Under the Street” (9/28/91) – Peter is abducted by giant insects whose leader plans to sacrifice him. “Slimer for Hire / Cruisin’ for a Bruisin’ / Nothing to Sneeze At” (9/10/88) – Slimer helps Rudy walk dogs but Dweeb is after him. / Slimer tries to get Fred past Bruiser to attend a BBQ. / Slimer is in charge when the guys are sick and has to deal with Manx. “A Mouse in the House / Cash or Slime / Doctor Dweeb, I Presume” (9/17/88) – Manx chases a mouse around the firehouse, causing a mess Slimer is blamed for. / Bruiser keeps Slimer from buying Chilly’s birthday present. 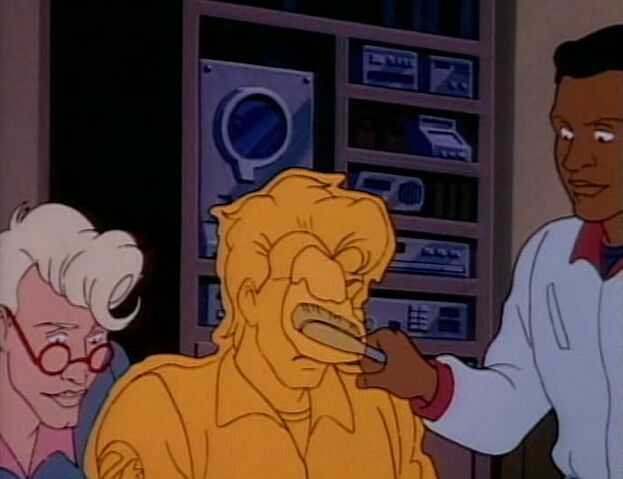 / Dweeb tries to nab Slimer at the doctor’s with Janine. “Pigeon-Cooped / Go-pher It” (9/24/88) – Slimer tries to teach a pigeon how to fly while protecting it from Manx. / Slimer deals with a gopher in his garden. “Sticky Fingers / Don’t Tease the Sleaze” (10/8/88) – Dweeb interrupts Slimer’s wallpapering of the kitchen. / Slimer attempts to recapture the Sleaze after accidentally releasing him. “Room at the Top / Tea but not Sympathy / Special Delivery” (10/15/88) – Slimer tries to find a quiet place to enjoy his new comic book. / Manx fakes being sick so Slimer has to take care of him. / Manx tries to get at the food Luigi asks Slimer to deliver for him. “Out With Grout / Dr. Strangedog” (10/22/88) – Bud and Slimer get Grout a job at a new hotel but must get him back when Dweeb takes over the old one. / Slimer must stop Dr. Strangedog from turning humans into dogs’ servants. “Slimer’s Silly Symphony / Little Green Sliming Hood / Monkey See, Monkey Don’t” (11/5/88) – Egon gives Slimer a conductor’s baton, inspiring him to start his own symphony. / To stop his watching TV, Peter tells Slimer the story of Little Red Riding Hood. / Rudy is inspired to go into business after seeing an organ grinder. “Beach Blanket Bruiser / Class Clown / Dog Days” (11/12/88) – Slimer has to prevent Bruiser from spoiling Fred’s fun at the beach. / Slimer has difficulty getting Donald scripts he lost. / Slimer helps Fred pass obedience school. “The Dirty Half-Dozen / Movie Madness” (10/29/88) – Ghoullem and Zugg put the guys to sleep to get uninterrupted revenge on Slimer. / Slimer helps Bud clean the theater to see his favorite movie for free, but Dweeb has other plans. “Show Dog Showdown / The Not-So-Great Outdoors / Unidentified Sliming Object” (12/3/88) – Slimer and Fred compete against Dweeb and Elizabeth at a dog show. / Slimer and Chilly encounter mischievous rabbits on a camping trip. / Aliens abduct Slimer. “Up Close and Too Personal / Sweet Revenge” (12/10/88) – Slimer uses his video camera to catch Manx in embarrassing moments and film Luigi’s commercial. / Dweeb dresses as Slimer on Halloween and ends up doing his chores and being targeted by evil ghosts. “Rainy Day Slimer / Slimer & the Beanstalk / Space Case” (11/26/88) – On a rainy day Slimer enters his drawing of the amusement park to have fun. / Peter reads Slimer Jack and the Beanstalk. / Slimer gives an alien a tour of the city. “Scareface “ (10/1/88) – Slimer disguises himself as Scareface to evade Ghoullem and Zugg.